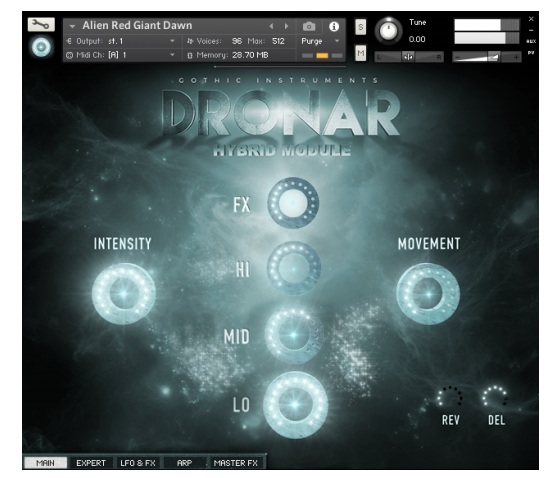 Dronar is a virtual instrument from Gothic Instruments. It has several modules and more to come. The engine idea is to create complex pads and atmospheres with a small number of notes, add a root bass note, a high note, and sound effects. LFOs and arpeggiators are also available to make the sound even richer. 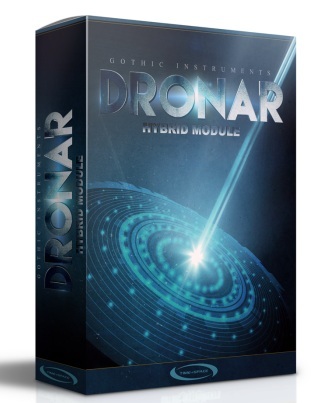 Hybrid Module allows the user to create astonishing strings and pads in a simple interface. 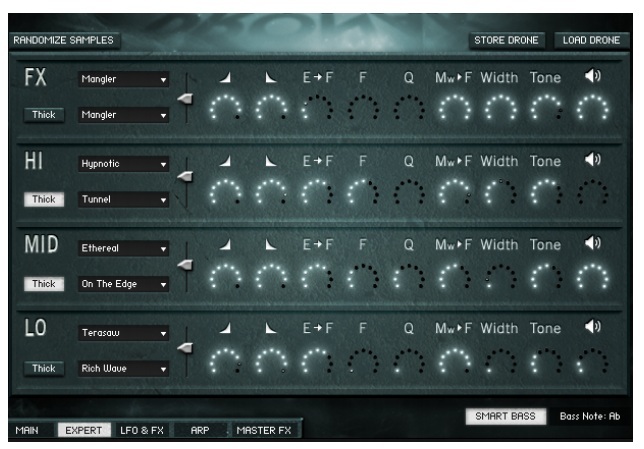 It works with the concept of ‘Drone’: a patch made of 4 slots where you can add sounds and effects. FX, HI, MID and LO, the 4 slots of a drone, work as layers. It’s possible to add two sounds (actually, 20-second loops at 3 dynamic levels). HI, MID and LO slots will add notes in the respective ranges, while FX will add sound effects. Intensity controls the main velocity of different layers, going from silence to max volume. It can also be controlled by the Mod Wheel. Movement is a global controller for the intensity of the arpeggiators. You can solo any control by ALT+clicking it. To mute, just click on the control’s name. On each slot (FX, Hi, Mid and Lo) there are 2 drop-down menus so you can select the sound. At the right there’s an A/B slider, making it possible to blend both sounds. Each slot will also have Attack and Release knobs, Filter settings, Width, Tone and Volume controls. Hybrid Module has an LFO&FX tab, so it’s possible to create interesting and complex results. LFO settings include Rate, Shape, Pan, Pitch, and MWheel. FX settings include Distortion and Chorus effects as inserts and Reverb and Delay as sends. The instrument also has a built-in arpeggiator, with independent settings for Hi, Mid, Lo and Fx slots. – Requires Kontakt 5.5 full version.